Here's a hilarious melodrama spoof whose oddball characters seemingly ad lib their way through the wildest plot ever to come down the pike. Lovely, innocent Constance Purdy is about to lose her home to that villain-about-town, Wiley Schlink. Will hero Monroe Mannerly ride to the rescue in time? 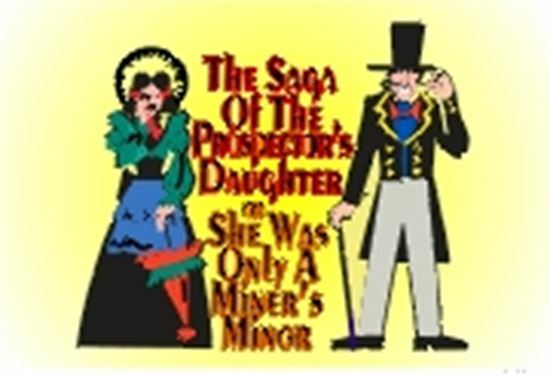 Will her long-lost prospector father show up and save the day? These questions aren't really answered because we're laughing too hard at the sheriff who has a mortgage on her own jail, a medicine man who ends up in a dress, and a saloon-smashing suffragette whose ax works great on cuticles. Add a piano player with an attitude and a grizzly old prospector/narrator who'd like a different ending to the play, and you get some idea of folks who populate this fool's gold rush town. Great fun to watch and to perform, especially when the actors are caught napping and playing cards as Act II opens.